N E O N _ C I T Y _ L I G H T S presents. Coca-Cola Evergreen N eon C lock. This is a brand new neon clock with a powerful transformer. This neon is hand-blown glass complete with a glass clock face and a rim that is Chrome finished. Note: the only neon on this clock is the single ring of green neon. The clock mechanism runs off a AA Battery (not included) and has an excellent quality Quartz movement. AC Adapter (included) plugs into the clock and standard US outlet to power the neon. Fully licensed by Coca-Cola through Neonetics Inc. Sent from our warehouse here in Maryland, NOT from China. 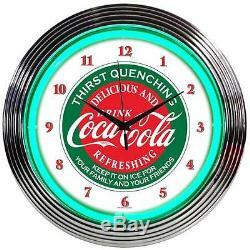 The dimensions for the piece are 15" in Diameter x 3" D. N E O N _ C I T Y _ L I G H T S.
The item "Coca-Cola Evergreen Neon clock sign style Coca Cola Coke Soda Thirst Quenching" is in sale since Thursday, September 06, 2012. This item is in the category "Collectibles\Advertising\Soda\Coca-Cola\Other Coca-Cola Ads". The seller is "neon_city_lights" and is located in Carroll County, Maryland. This item can be shipped to United States.